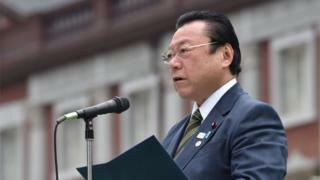 Japan's Olympics Minister Yoshitaka Sakurada has resigned over comments that offended people affected by a huge tsunami and earthquake in 2011. He said in February that he was disappointed by a Japanese swimmer's leukaemia diagnosis. He said he was worried that medal favourite Rikako Ikee's illness might dampen enthusiasm for next year's Olympics. Mr Sakurada also admitted last year to never having used a computer, despite being Japan's cyber security minister. After accepting Mr Sakurada's resignation, Prime Minister Shinzo Abe apologised for appointing him. "I deeply apologise for his remark to the people in the disaster-hit areas," said Mr Abe. He also came under fire in 2016 for describing so-called comfort women forced to provide sexual services to Japanese war-time troops as "professional prostitutes".